Posted in Ayahuasca, Books, Consciousness, DMT, Psilocybin, Psychedelics, Terence McKenna (mp3). 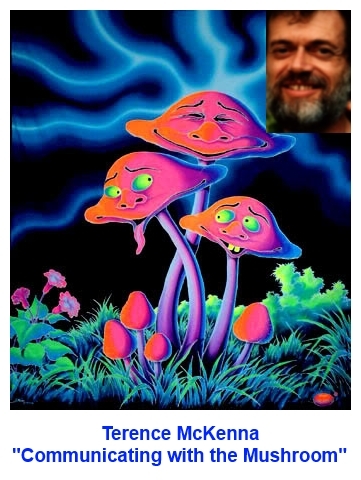 McKenna’s description of the ‘shroom as communicating verbally struck a chord with me, in appreciation for his work & these shows I’ll offer a couple things it’s said to me over the years. “This world is shot through.” Which I take to mean that material reality is, from some viewpoint, less impermeable and opaque than we tend to perceive. Another time I looked to the sky and heard “The diamond jewel of heaven smiles upon you, because you are.” Not sure what that means except I can’t think of a more singularly beautiful thought. Smiles to you too, Lorenzo. The world needs more people like you Lorenzo. I look up to you very much. Did I miss the Burning Man update a while back? I havnt heard anything about the lectures yet & we are a week away!!!! I’m pretty religious about the podcast too. I was hoping to meet you again like in 2007. Love Love Love Lorenzo! Another one of “the best”. I can only thank God, the Goddess and your parents for your 72 years on Earth, Lorenzo, but I THANK YOU for the last 10 of keepin the faith and pulling others in through this here medium.